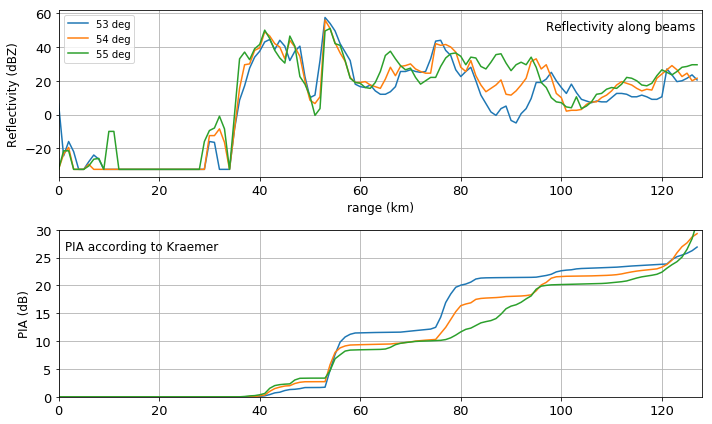 In this example, we will compare different approaches to constrain the gate-by-gate retrieval of path-integrated attenuation. Rainfall-induced attenuation is a major source of underestimation for radar-based precipitation estimation at C-band and X-band. Unconstrained forward gate-by-gate correction is known to be inherently unstable and thus not suited for unsupervised quality control procedures. Ideally, reference measurements (e.g. from microwave links) should be used to constrain gate-by-gate procedures. However, such attenuation references are usually not available. \(\omega radlib\) provides a pragmatic approach to constrain gate-by-gate correction procedures, inspired by the work of Kraemer et al., 2008. It turned out that these procedures can effectively reduce the error introduced by attenuation, and, at the same time, minimize instability issues (Jacobi et al., 2016). 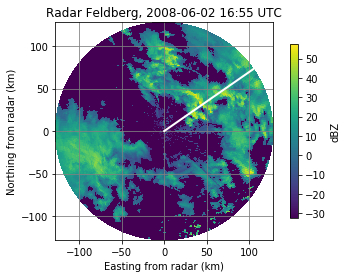 Let’s have a look at the situation in South-West Germany on June 2nd, 2008, at 16:55 UTC, as observed by the DWD C-band radar on mount Feldberg. We see a set of convective cells with high rainfall intensity in the NE-sector of the Feldberg radar. Let us examine the reflectivity profile along three beams which at azimuths 53-55 degree (as marked by the white line in the PPI above). In the coefficients dictionary, we can pass the power law parameters of the A(Z) relation as well as the gate length (in km). If we pass “warn” as the mode argument, we will obtain a warning log in case the corrected reflectivity exceeds the value of argument thrs (dBZ). 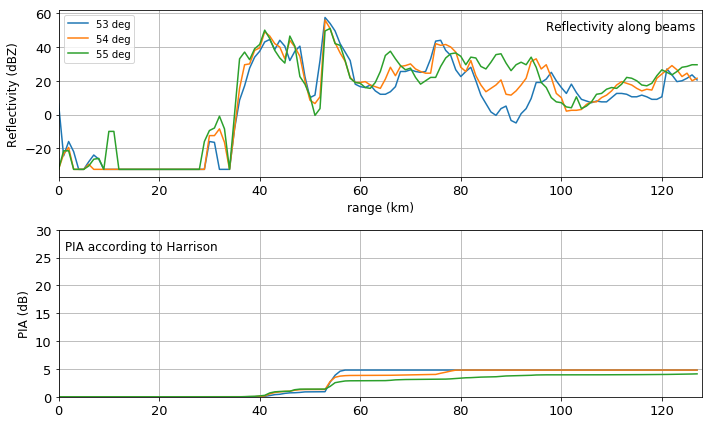 Plotting the result below the reflectivity profile, we obtain the following figure. 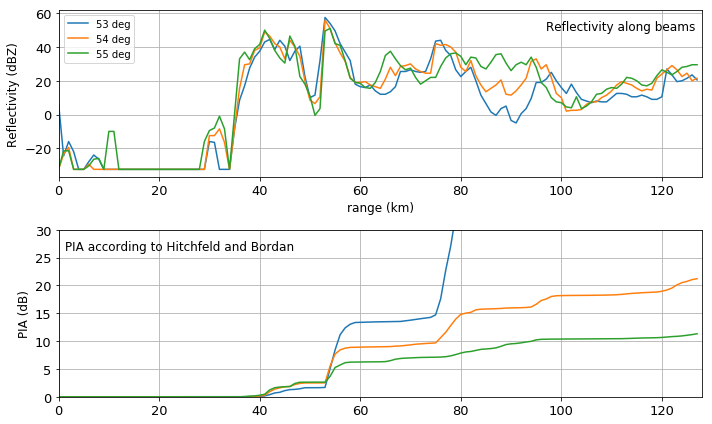 Apparently, slight differences in the reflectivity profile can cause a dramatic change in the behaviour. 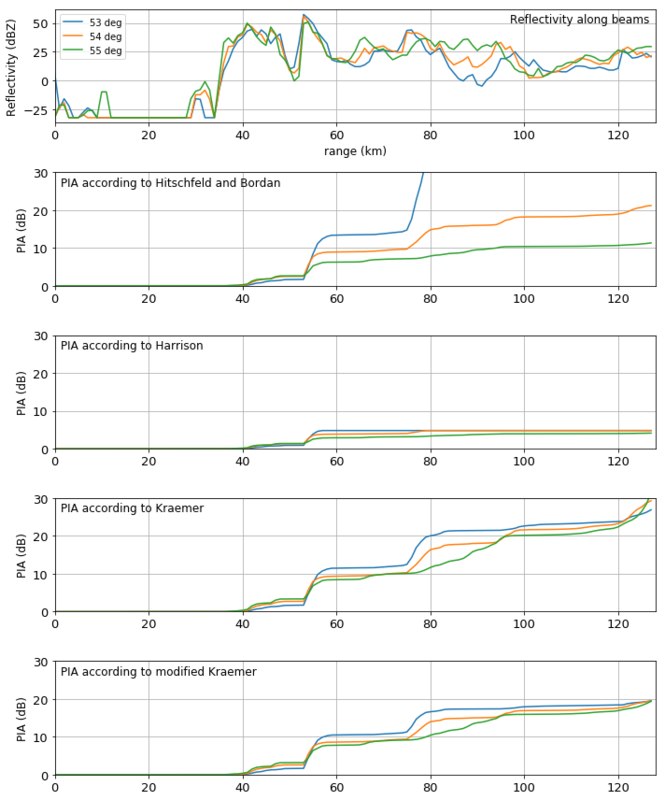 While at 54 and 55 degrees, the retrieval of PIA appears to be fairly stable, the profile of PIA for 53 degree demonstrates a case of instability. Harrison et al., 2000 suggested to simply cap PIA in case it would cause a correction of rainfall intensity by more than a factor of two. Depending on the parameters of the Z(R) relationship, that would correpond to PIA values between 4 and 5 dB (4.8 dB if we assume exponent b=1.6). Plotting all of the above methods (Hitschfeld and Bordan, Harrison, Kraemer, Modified Kraemer allows for a better comparison of their behaviour. Please refer to Jacobi et al., 2016 for an in-depth discussion of this example.